A sandbox space simulator developed by Egosoft. It is the fourth full-fledged installment of the popular series X. Similarly to its predecessors, X4: Foundations focuses mostly on giving the players a freedom in how they want to play. X4 is a sandbox space simulator released on PC. The title was developed by Egosoft, the creators of all previous entries in the series. The main foundation of the game is freedom. At the beginning of X4: The Foundations for PC the player controls a cheap space ship with weak specifications and he is being thrown into the middle of an open galaxy. What he does next is entirely up to him. The game doesn’t limit player’s actions in any way. The user can freely decide whether to become a space merchant, a pirate, a soldier, a bounty hunter, an assassin, a discoverer or a miner. It is also possible to combine various career choices. The virtual universe is a dynamical world that is being shaped by player’s actions. The game features more possibilities than other similar titles, as it is possible for player to construct his own space stations and ship armadas that can be used for waging war against hostile factions. The game is considered a return to the roots of the series. Contrary to X Rebirth from 2014, which simplified the game in many ways, X4 is based on mechanics of the much more complicated and advanced X3 Terran Conflict (2008). At the same time, it introduces many improvements and novelties. 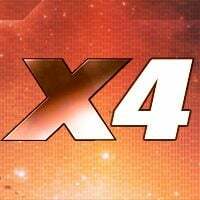 X4 for PC enables the player to pilot many different ships. Each of them can be modified or upgraded by changing parts and installing bought systems. The developers implemented a new interface that enables the player to command large space fleets and to freely construct space stations by manually assembling individual modules. Game score 8.5 / 10 calculated out of 82 players' votes. Expectations before the premiere: 8.7 / 10 calculated out of 44 players' votes.